Hear the word “equitation” and many horse enthusiasts think of a class judged on the rider’s form and effectiveness. In reality, the definition of equitation is just the art and practice of horsemanship and horse riding. From there one could say, Working Equitation (WE) is the art and practice of horsemanship as it applies to the tasks that horses help people perform on the ranch. While WE is an international sport originally pioneered by Italy, Portugal, Spain, and France, it is hitting its stride in the United States. The first international competition was held in 1996 and then in 2004, the World Association for Working Equitation (WAWE) was established to govern the sport. WAWE rules are used for all international competitions, but each individual country has its own rules for domestic competitions. Working Equitation was formed to celebrate and showcase the horse and rider partnership with a foundation in classical horsemanship and the use of the horse in ranch work. The sport seeks to support and allow countries to stay true to their own historical types of horsemanship, as well as working traditions and their traditional tack and attire. Of course in the United States, that is a very diverse group with a melting pot of traditions and styles. At local competitions you will see all shapes of saddles and styles of dress. 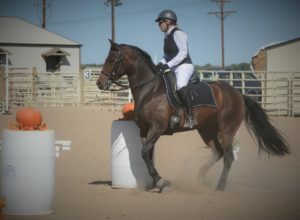 In the United States, Working Equitation competitions offer five performance levels to accommodate horses and riders at various stages of training: Introductory, Novice, Intermediate, Advanced, and Masters. The Masters level is the international standard of the sport. In each level there are four trials or tests that are put together at a competition. First, the Dressage trial consists of a test where collective marks are given for movements considering the horse’s impulsion, submission, and quality of gaits, as well as for the rider’s position and effective use of aids. As with classical Dressage, each level builds upon the last and prepares the horses training for the next level. The second trial is Ease of Handling, which applies the skills performed in the Dressage test to an obstacle course. Each obstacle is given a score of 0-10 paying attention to the quality, ease, symmetry and geometry of the obstacles and transitions in between in light of what is looked for in the Dressage phase. Third is the Speed trial which is often the horse and rider’s favorite, as well the spectators. This phase takes a part of the same obstacle course as in the Ease of Handling phase, but time becomes the key component with time penalties being added for errors. Finally, the Cow trial tests the ability of horse and rider pairs to work cattle individually and with a group of 3-4 horse and rider teams. The objective is for each rider to individually sort, cut, and herd a pre-selected cow from the herd and then as a team herd the selected cow into a designated pen. Due to the logistics of having cattle at an event, not all competitions have the Cow trial. At the end of the competition, horse and rider pairs receive scores based on their placing in each of the trials, and then the scores are tallied to determine the overall placings. Over the past few years there have been a growing number of WE enthusiasts in the foothills. Indian Hills resident Christina Turissini has been the force behind organizing lessons, clinics and play days for WE. The foothills group started when Christina won a free group lesson from Allison Mazurkiewicz at a High Country WE event which resulted in bringing Allison to our area. Allison is excited to see this group flourish with regular clinics and advance in the sport. 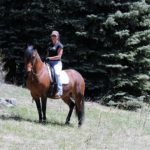 The Foothills group has a wide variety of horses and riders which makes her clinics educational for all, whether riding or watching. Allison’s aim is to be an ambassador for the sport and spread the fun that is WE. Allison competes up to the Intermediate level, holds an “r” judge card with the Confederation of WE (as well as holding a board position), is a member of WE United and is a founding member of High Country WE (created in 2014), who puts on several shows in Colorado every year. Local Claire Gosnell and her horse Bitta, an 11 year old Tennessee Walking Horse have been training and competing in WE since 2013. Claire has found WE to be a great way to strengthen the horse and rider bond, as well as their communication in a powerful way. Intermountain Horse Association Poker Ride, Upcoming Meetings and The Westernaires! As a horse person around our foothills community, I often get questions about where to meet other horse people and how to find people to ride with. As a member of the Intermountain Horse Association, I have found this group to be one of the most diverse groups of local men and women that are passionate about horses. People in this group are trail riders, dressage riders, barrel racers, ropers, eventers, fox hunters, ranch sorters, endurance riders and more, not to mention that many of them are active members of other horse organizations. IHA meets from September – May on the 3rd Tuesday’s of the month in the event room (take a left before host stand) at Beau Jos in Downtown Evergreen. Come early to socialize at 6:30pm. Food and beverages available. The meeting starts at 7pm and topics include subjects such as pasture management, saddle fitting, weed management, Africa on horseback, trail riding in Colorado, the Colorado Horse Industry, joint therapies, infectious diseases and more. Plan to come out this year to these meetings and get to know others in your horse community. The IHA group is welcoming and made up of passionate horse people throughout the foothills community. See more information at intermountainhorse.org or find them on Facebook at IntermountainHorse. The meetings for this season are: October 17, November 21, December 19 (Christmas Party at The McWilliams’- not at Beau Jos! ), January 16, February 20, March 20, April 17, May 15. Ever year in the first couple of weeks of September, the IHA organizes a Poker Ride at Alderfer Three Sisters Ranch Open Space Park in Evergreen. Winning high and low hand riders split the pot with a local non-profit horse organization. This year’s ride fell on September 9th with The Westernaires as the beneficiary. This spring, The Westernaires horses suffered an outbreak of a highly infectious disease often called Strangles. This resulted in veterinary expenses and lost income due to a quarantine of the facility. The IHA Poker Ride was able to donate $1,200 to The Westernaires thanks to the participants and sponsors! If you are new to the area, The Westernaires are a world-renowned horse program that was started in 1954 in Golden, Colorado. Because of its high standards and success, similar programs across the country have been modeled after The Westernaires. The non-profit organization is represented by over 1,000 kids from 9-19 years old. They encourage “self-respect, responsibility and leadership through horsemanship and family participation”. At its foundation, The Westernaires is a precision mounted drill team, but it is much more than that. Kids progress through levels of teams that include reenactments, Dressage teams, jumping, driving ponies and so much more. Learning proper horse care is a foundational value and the kids and families are dedicated to immersing themselves in excellence, Western heritage and values. The Westernaires organization owns over 80 horses and ponies, plus some mules and draft horses, making this a great place for horse crazy kids to get started and involved with horses. To learn a little bit more about them, their annual show called Horsecapades is coming up at the end of this month. Please buy tickets at the grocery from these hard-working kids and take your family and friends to a performance. Performances are: Saturday, October 28th — 10am; Saturday, October 28th — 2pm*; Saturday, October 28th — 7pm*; Sunday, October 29th — 2pm**a pre-show begins 30 minutes in advance. Go to their website at Westernaires.org for more information on the program or Horsecapades. “The magic that happens between the horse and equestrian is just that, magic. Our job is simply to allow that to happen in a safe and nurturing environment.” Cindi Winner, EquiGrace, Inc. Founder. Horse people joke that their horse is their therapist, their therapist lives in a barn, or they pay their therapist in hay and grain. Whether we realize it or not, there is real truth in those statements supported by documented studies that show the infinite benefits that humans receive by being around horses. Equine Assisted Activities and Therapies (EAAT), are used to treat patients challenged with everything from cerebral palsy and autism, to drug and alcohol dependency and post-traumatic stress syndrome. The benefits range from learning non-verbal communication, relaxation, mental awareness, physical therapy through the movement and rhythm of horses to leadership training and team building. Studies show that people working with horses experience decreased blood pressure, lower stress levels and reduced feelings of tension, anxiety and anger. In addition, studies show you gain feelings of self-esteem, empowerment, patience and trust. EquiGrace, Inc, is a relatively new Equine Assisted Activities and Therapies facility in our area. Not far from the town of Bailey, EquiGrace is working to get the word out to the special needs community as well as those that would benefit from their Hero’s Program for veterans, police officers, firefighters and emergency personnel, that they have openings for new students and clients. Twenty-five-year-old Mack Port of Grant, Colorado is a current student at EquiGrace who started Hippotherapy as a child. Hippotherapy is defined as the use of horseback riding as a therapeutic or rehabilitative treatment, especially as a means of improving coordination, balance, and strength. 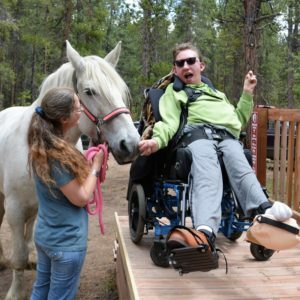 His mom Sandee could see the benefits that Mack received from Hippotherapy to help with his Cerebral Palsy, but unfortunately the drive to the closest facility in Boulder took away from the benefits. Originally from Philadelphia and South Jersey, EquiGrace’s Founder Cindi Winner, spent the majority of her life doing horse related activities, including showing in English and Western disciplines as well as driving carriages. While horses are a significant part of her life, Cindi realized her first love was teaching. 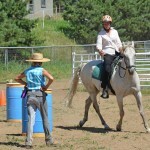 She combined horses and teaching in 2003 when she became a PATH International Certified Instructor (pathintl.org). 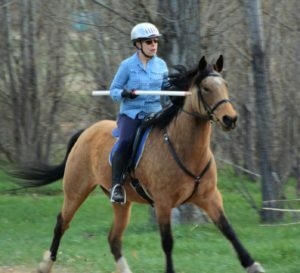 In 2004 she founded a NARHA center in New Jersey called GRACE Therapeutic Riding Center and discovered the amazing gifts that horses can give to their students. After moving to Colorado, Cindi started teaching EAAT at a facility in Salida. Mack and his family first met Cindi when she was an aid for Mack in High School. Mack started EAAT with Cindi in Salida and now have a much shorter drive since Cindi moved to Whispering Pines Ranch near the town of Bailey. Sandee was thrilled to be able to start bringing Mack to Equine Assisted Activities and Therapy again. Being with the horses is the highlight of his week, plus they have found a close-knit community to be a part of. Mack is currently working with Hawk, a Quarter Horse gelding in his mid-20’s. Mack grooms Hawk as well as guides him from his wheelchair through a continually engaging course in the arena. His goal for this year is to be able to get back to riding by the fall. Mack’s family is donating the ramp that is needed to facilitate getting the wheelchair into the correct position for Mack to get in the saddle. Following Mack’s work with Hawk, he is physically loose and mentally happy. For riding, Mack will start working with Annie, a Percheron cross in her late teens who both rides and drives. Could you or someone you know benefit physically and/or mentally from Equine Assisted Activities and Therapies? 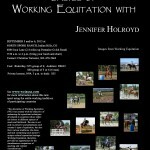 Visit EquiGrace.com to read more about their programs as well as biographies on the horses and humans. Learn about opportunities to volunteer, donate or even buy any of the horse’s dinner! I saw a child, who couldn’t walk, sit on a horse, laugh and talk. Then ride it through a field of daisies and yet he could not walk unaided. I saw a child, no legs below, sit on a horse and make it go. Through woods of green and places he had never been; to sit and stare, except from a chair. I saw a child who could only crawl mount a horse and sit up tall. Put it through degrees of paces and laugh at the wonder in our faces. I saw a child born into strife, take up and hold the reins of life. Trail riding and horse camping group. BBSCGolden.org for extensive calendar and club information. June 10 – Gymkhana open to public and all ages – especially 4-H! Registration 8am, start 9am. Lunch Included. See website for forms. Indiana Equestrian Center 7500 Indiana St, Arvada, CO, Contact John Lind 303-931-0132. Colorado Horsecare Foodbank – FUNdraisers! See website for dates and to sign up online. www.horsefoodbank.org. 303-670-1470. September 16 – Hay Bales & Horse Tails – Amazing evening of food, fun and shopping for horse stuff! At the Colorado Horse Park in the Banquet Hall. Sign up now, event sells out! http://www.dhphorses.com/summer-camps. Cross Horns Ranch, Evergreen. [email protected] or 303-918-6367. Reffel’s Arena, Wandcrest Drive, Pine Junction. Varies Saturdays or Sundays, 10am-2pm. For full schedule and more information, go to: the Facebook page at “Evergreen Ranch Sorting Association”. ERSA is a non-profit organization that was created in 2010 for the expressed purpose of perpetuating the Western Way of Lifestyle by utilizing our equine partners to learn, practice & compete in the sport of cattle sorting. While there is an international sanctioned organization (Ranch Sorting National Championships – RSNC), ERSA is not affiliated with the RSNC in any way; though many of the ERSA members also compete in official RSNC events. There are about 40 members plus guests that meet once each week at J R Heart Cattle Co., LLC near Pine Junction, Colorado in order to participate in team/ranch sorting. There are about 18 event days each year starting about the first of June and ending about the first of October each year. In addition, there are a couple of social events each year along with a “members only” Buckle Sort to establish bragging rights for each year. Evergreen Rodeo Association – Rodeo Weekend! June 17 Saturday – Rodeo Performance at El Pinal Rodeo Grounds 5 pm, Mutton Bustin’ and Pre-Show starting at 330pm. June 18 Sunday – Rodeo Performance at El Pinal Rodeo Grounds 2 pm, Mutton Bustin’ and Pre-Show starting at 1230pm. June 11 – 9am. 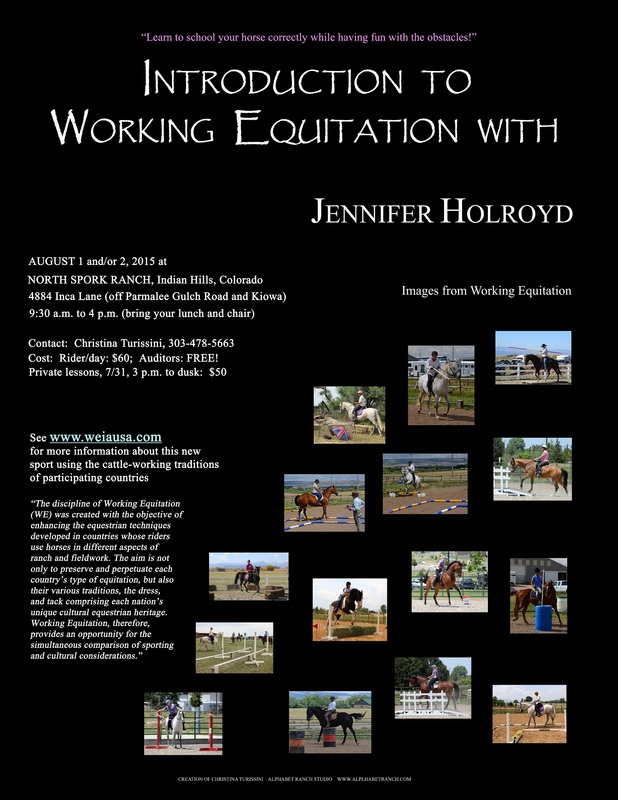 Hosted by the Colorado Horse Council. Trailer parking and start at Evergreen Rodeo Grounds. Ride to Elk Meadow Open Space Park. September 9 – Poker Ride at Alderfer Three Sisters Park. English, Western, Showmanship and Gymkhana classes. More information, contact info and show bills at: http://www.extension.colostate.edu/jefferson/4h/4h.shtml. Extension Office for information at 303-271-6620. Kip’s website: LaRiataRanch.com. Jefferson County Fairgrounds Event Center in Golden. Hosted by Andrew & Heather McWilliams. Call Heather for more information 303-638-0994. September 15-17: Sign up for both classes or one. $450/3 day class, $150 deposit/3 day class. 3 day Ground Work Class – mornings & 3 day Horsemanship Class – afternoons. Kip has over 30 years horse experience. Buck Brannaman invited Kip to tour with him exclusively for 5 years. Soft feel, better communication with your horse. Problem horses, English or western welcome. Kip’s wife Missy is a Dressage trainer and last year he rode their Dutch Warmblood, Ali in the clinic. Two classes include 1. GW – Groundwork (addresses doing ground work exercises before riding toward the end of each class) in the morning class and 2. H1-Horsemanship Class (a riding class for all levels and disciplines of horses) in afternoon. Stalls, RV hookups available with reservations at fairgrounds 303-271-6600. Hotels and restaurants within 5 minutes of venue. Spaces are filling up, call today to sign up! Find on Facebook or 720-243-4186. May 20, June 10, June 24, July 8, July 29, August 12 – Awards September 9th. Filed Under: Blog, Featured Blog Posts, Local Events, Local Groups, What's New? As we enter the fall, riding weather becomes cooler and the foliage more colorful. While the cool weather certainly brings lovely riding weather, we all know that winter is not far in the distance. Winter is beautiful in its own right and brings a season of new outdoor activities, although for some of us it is a forced break from any kind of significant horse activities. Trails can be slippery, outdoor riding arenas are snowy and hard. Not to mention, riding your horse to a certain level of activity while they have their “winter jacket” on is just not ideal. Are you missing that connection to the outer horse world in the “off season”? Want to use your sojourn for a productive use? Intermountain Horse Association – IHA might be the answer. Intermountain Horse Association has been going on for over a decade after the Denver Foothills portion of a “down the hill” group decided to bring a horse group closer to home. Members from Bailey to Golden meet once a month, September through May to hear speakers on a variety of horse related topics. All of the topics are directly applicable to horse owners and horse property owners in the mountain areas. That said, we have a contingent of horse enthusiasts that do not own horses, but are looking for horse knowledge and fellowship with other horse people. Meetings are held on the third Tuesdays of the month in the Downtown Evergreen Beau Jos from 7-8 pm. Members often arrive around 6:30pm to socialize with other members in the horse community. Beau Jos graciously offers the room free of charge and has wait staff ready for anyone who would like to enjoy dinner or beverages during the meeting. Please join us on October 18th for our next meeting. The special guest is Colorado Water Commissioner, Tim Buckley. After his informative talk last year regarding legal use of water in Colorado, he was the number one requested speaker to return this year. Whether you keep horses at your property or not, you do not want to miss Tim. At the meeting we will also vote on the new board nominees for 2016-2017. Some of the other meetings topics that will be returning this year are mountain pasture management, weed management and specific veterinary topics. Members have asked that some of the new content be related to topics such as forest management related to horses and our area, trail safety, trail riding and horse camping. The Intermountain Horse Association also hosts the IHA Poker Ride at Alderfer Three Sisters Open Space park the Saturday following Labor Day Weekend. The Poker Ride is not only a way to get horse people together, but it helps to bring ambassadors for our trails to the local open space parks. Riders have the opportunity to win cash for high and low poker hands while all proceeds go to local horse related non-profit groups such as Colorado Horsecare Foodbank (horsefoodbank.com) and HEAT – Horse Evacuation Assistance Team (jeffcoheat.org – supporting all large animals in case of natural disasters or other emergencies). Meeting dates for the 2016-2017 season year will be as follows: October 18, November 15, December 20 (Christmas Party! ), January 17, February 21, March 21, April 18, May 16. Please consider being a part of this important local horse group! Email [email protected] to be added to the IHA email list. 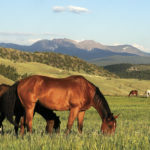 IHA now is set up for membership at intermountainhorse.org, or just join us at an upcoming meeting. The Heritage Ride comes to Evergreen June 12th! 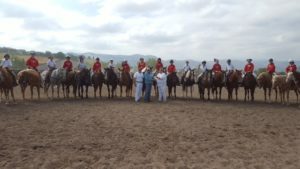 The Heritage Ride was started in 2013 by the Colorado Horse Council – CHC. For the first three years it has been held solely at Greenland Open Space in Douglas County with well over 100 riders and spectators in attendance. This year there will be five Heritage Rides over 2 weekends in Colorado! If you are new to our area, the Colorado Horse Council was established in 1972 and has been responsible for protecting and promoting the interests of horse enthusiasts throughout the state and nation. Based on a study done by the American Horse Council in 2005, the horse industry accounts for $1.6 billion of our state economy. Much of the work done by CHC is on the government level protecting the interests of the equine industry regarding decision making and the passing of laws and regulations. The role of the CHC is to educate and inform individuals about the equine community, the equine industry and its heritage in the State of Colorado. To PROMOTE the Heritage of the Horse. Rich and meaningful in Colorado, promoting the equine industry requires continual education in the areas of welfare, training, legal responsibility and cultural understanding. To PROTECT the Heritage of the Horse. This encompasses the rights of individuals to enjoy, own and actively use the natural resources and the manmade infrastructure our state has to offer for equestrian activities. To DEVELOP the future Heritage of the Horse. This has a meaningful human and financial impact on our state which includes quality of life components that is inherent in the reasons why people choose to live work, work and play in Colorado. This year the Colorado Horse Council has set the financial goal for The Heritage Ride at $14,000. On two different dates and in 5 locations (so far!) there will be five rides. The $35 / rider entry fee will directly impact the equine industry in Colorado. Lunch is included. There will be vendor booths for perusing and great fellowship with other horse enthusiasts. The Evergreen Rodeo Association stepped up to host the Jefferson County Heritage Ride in Evergreen the weekend before the Evergreen Rodeo comes to town. The ride will be starting at the Evergreen Rodeo Grounds and take a “trail boss” guided loop through Elk Meadow Open Space Park. Vendors and lunch will be back at the rodeo grounds. Sunday, June 12 at 9am 2-3 hour loop through Elk Meadow. $35 per rider (includes lunch). Evergreen Rodeo Grounds – 29830 Stagecoach Blvd, Evergreen, Colorado. In addition to riding, there are other ways to support The Heritage Ride. Send a representative from your club to ride along with pledges from the clubs members. Organizations – Reserve a booth and recruit members to provide educational materials. Volunteer to help, even if you are riding! Organize a group of your friends to come out to ride together. Make this your family ride and enjoy networking with other horse folks. Just get out and ride to get your horses ready for the rest of the summer! For more information, registration forms, directions and pledge forms, go to: ColoradoHorseCouncil.com or text “horses” to “70000”. Colorado Horse Council, 22 S. 4th Ave #106 Brighton, CO 80601. 303-292-4981. The following weekend (Father’s Day Weekend! ), please join us for the 50th Evergreen Rodeo and Weekend Events! Friday Family Fun Night to benefit Tri-County Elks Little Britches- June 17th 3 PM to 10 PM Adults $10, Children 6-12 years $5, Children under 5 Free! You can lead a horse to water, but is he allowed to drink it?! Many residents of our Foothills communities, the Denver Region, and even the entire State of Colorado give no thought to the source of water for their horses. Whether it be a “frost free” spigot, a garden hose running from the house, or plumbed automatic waterers, owners turn on the tap and let the water flow. However, at a recent Intermountain Horse Association meeting, Colorado Water Commissioner Tim Buckley explained that it is important for owners to understand the legal issues relating to sources of water and its availability for their horses and/or livestock. According to Buckley, all waters in the state of Colorado are owned by the people of Colorado. The right to use the water or a “water right” is the right to divert or use the water under the prior appropriation system as long as the water is put to a beneficial use. The “State” or departments such as division of Parks and Wildlife and others own water rights but are not any different than a private water right holder. The function of the Department of Water Resources is to administer these rights. Even rain water collected in buckets, barrels, or puddles in the pasture, is not necessarily available for a landowners use. Matter of fact, unless a property owner has specific legal rights to use rain water, ground water, or even their well water for a specific purpose, they are compelled to leave the water where it is. If you have ever purchased a property served by a well, hopefully your REALTOR discussed the category of that well. Common categories are Household, Domestic, and maybe Livestock. These categories confuse most everyone. After all, wouldn’t Domestic mean indoors? As a rule of thumb, with multiple noted exceptions, Household is for use only inside the house. No exterior watering of plants, animals or even washing your car in the driveway. If you fill up Fido’s bowl, do it from the kitchen sink. In certain cases a Household well could be augmented (a water court process) to allow for a limited watering of a horse or two – but the parameters of use will be very well defined. Domestic wells are more likely to allow for the watering of an outdoor pet like a horse, or a donkey or even maybe a goat. However, “Domestic” does not indicate a blanket permission either. It is important to read the well permit directly, looking for keywords or phrases. Never assume that a Domestic well category gives you the freedom you are looking for without verification. For example, most Domestic wells would not allow for you to board outside horses on your property. Another category we run across on older, farm or ranch use properties can be “Livestock”. This category gives broader permissions and allows a wider variety of uses. Cows, horses, goats, etc., can be allowed to be watered from these types of wells. That said, read the permit itself for limitations or further definition. What about your pond or the creek that runs seasonally or even year round through the back forty? The answer may surprise or even dismay you. Without an adjudicated (again – water court process) water right to use the water out of that pond or creek or ditch, you must not consider it a legal source for watering your horse. The good news is that the State of Colorado does not currently require you to keep your animal away with a fence or other barrier, but a stern admonition to your animal along the lines of “don’t drink that water” is in order. In recent years our Foothills communities have enjoyed excellent precipitation totals through wet springs and frequent summer showers. You have noticed both greener grass into August and September, along with uncommon rain showers ruining your picnic well into July. Not only are we grateful for this wonderful moisture and the late grazing our animals enjoy in the pastures, but the Colorado Division of Water sometimes declares a “Free River” status for water right enforcement. In layman’s terms, “Free River” conditions lead to a lighter enforcement of legal water use. How do you find out if your current source of water legally allows you to water your horse? There are several options available to you. Hopefully you received a copy of your well permit when you purchased your property (or when the well was drilled if you bought vacant land). Pull it out of the file and read it over, looking for the “type” description. A call to the Colorado Division of Water Ground Water information desk (303) 866-3587 is possibly the simplest solution. Leave your address and usually a return call within 24 hours gives you your well permit number and it’s prescribed use. Many don’t know that walk in’s are welcome M-F from 9-4 at the Colorado Division of Water office at 1313 Sherman St #821 in Denver. The folks there are super helpful and are happy to give you the information you need. What if you learn that Trigger can’t legally drink the water from your well? Commissioner Buckley offered more than one solution for that situation as well. An expensive alternative would be to add a water right to your well through a Water Court process. This involves a water attorney and a willing Seller, but is doable with patience and determination. A quicker and more cost effective alternative would be to install a cistern at your home and to purchase potable water from a number of local vendors. Keeping a record of your purchase history and the number of horses you are watering keeps you out of trouble. Looking to buy a horse property and wanting to conduct the proper due diligence to ensure that a legal water source for your horse is included? Seek out an experienced REALTOR who specializes in horse properties, farms and ranches. They can guide you through the process. I also recommend hiring a water attorney to conduct a title search to verify adjudicated water rights, especially in cases where more than a well permit is being transferred. It may cost you several hundred dollars, but the peace of mind it brings can easily justify the investment. Want to learn more? Visit the Division’s website at http://water.state.co.us. Call Commissioner Buckley’s office (303) 501-4298 or email him at [email protected] You want to be informed. Legal water use is a big deal for residents of Colorado. Heather McWilliams © 2015. Working Equitation – It may not be what you think it is! When I first heard of Working Equitation, I only heard the last word, Equitation and had flashbacks of rail classes growing up and in college. Of uncomfortably hollowing out my back to get the right look for the judges. Please forgive me Equitation stars, but that is my memory. Then sometime this year, I saw a YouTube video on Facebook of Pedro Torres of Portugal on one of several fabulous Lusitanos he rides in an event called Working Equitation. I was intrigued. High speed, over and around obstacles with impeccable form and finesse. It was kind of like Dressage, at high speed with obstacles. Reviewing past information I had come across with my newfound knowledge of this sport, I realized that people in our community had already been honing their skills in Working Equitation (WE). Italy, France, Spain and Portugal pioneered WE. 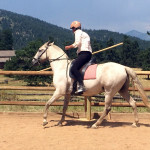 The discipline was created as a way to enhance the riding techniques developed in countries whose riders use horses in different aspects of ranch and fieldwork. The goal of WE is to preserve and perpetuate each country’s style of equitation as well as their cultural traditions of dress and tack. The first international competition was in 1996 and in 2004 the World Association for Working Equitation (WEWA) was established to govern the sport. WE has continued to grow throughout Europe and is rapidly catching on in the Americas. WEWA rules are used for international competitions, but each individual country maintains their own rules. Dressage – Dressage tests are ridden at each level. Each movement is given a numerical score, and collective marks are given for impulsion, compliance, calmness, rider’s position, etc. The dressage tests are designed to both test the horse and rider as well as to serve as an aid in training. The movements at each successive level build upon movements of the previous levels and coincide with the type and difficulty of movements expected in the Ease of Handling and Speed trials at the corresponding levels. Ease of Handling – Obstacles are set up to simulate the difficulties encountered by a horse and rider in the field. Obstacles are numbered and are ridden in order. The goal of this trial is to negotiate the obstacles with accuracy, ease, and smoothness. Speed – The obstacles utilized in the Ease of Handling trial are ridden at speed with no emphasis on style. Individual scores are based on elapsed time through the obstacles with time penalties added for mishandled obstacles. This trial is designed to test the rider’s co-ordination and capacity for anticipation in addition to the horse’s qualities of submission, speed, attention, and finesse. Cow Trial – This trial tests the ability of a horse and rider to work, individually and as a team, with cattle. The test is performed with a team of 3 or 4 riders. The objective is for each rider to individually sort, cut, and herd a pre-selected cow from the herd and then as a team put it in a designated pen. As a timed event, there are time penalties for course errors. 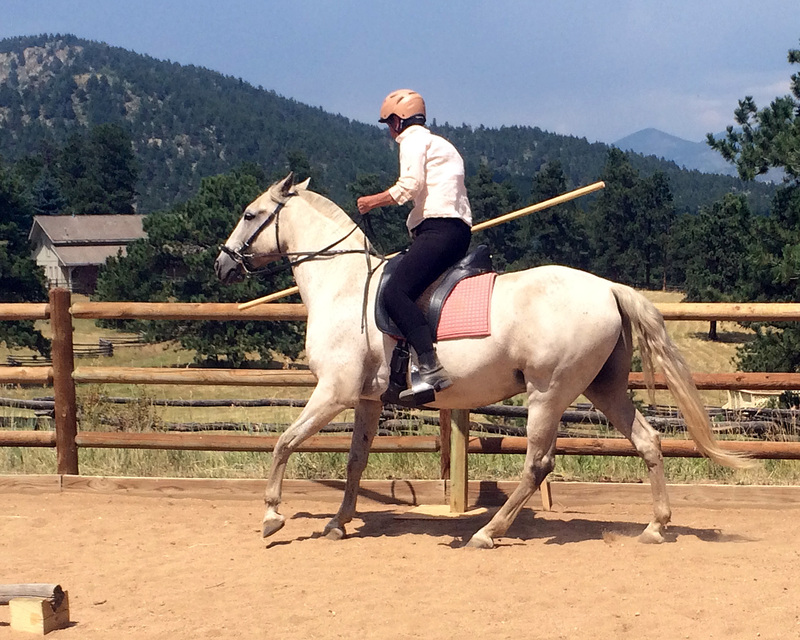 Indian Hills resident Christina Turissini was seeking to get more involved in WE and found that most of the Working Equitation clinics and competitions were either north or south of Denver, leading her to start a local group. To keep informed of local events coming up, find and join our group on Facebook under the name, Foothills CO Working Equitation. The group is for any type of horse, rider or saddle interested in honing their horsemanship skills via the sport of Working Equita tion. The news feed and “Files’’ section on the Facebook page is full of information about WE. After creating the group, Christina has organized local clinics and individual lessons with Instructor Jennifer Holroyd. In addition to the clinics, some of the members are hosting play days at their homes, which will continue through the winter months. 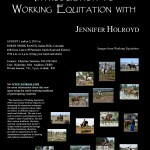 Jennifer Holroyd was born on a ranch in Portugal where the skills for Working Equitation were the daily standard. She started competing in Show Jumping competitions at the age of 10 and eventually competed at the international level all over Europe. In 1974 she married and spent 25 years in California where she taught and competed in Dressage, Combined Training and Show Jumping. 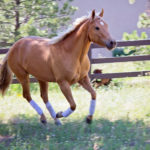 She is also considered a leader in the field of alternative therapies for horses including Chiropractic and an innovative technique using acupuncture points and sound vibration using tuning forks.